A drive to Emerald is an enjoyable jaunt out of town to the Dandenong Ranges, in rural southeast Melbourne. It's particularly nice on a Sunday morning when it includes a visit the Emerald Craft and Produce Market. Run by Eltham Community House, the market is located at the main roundabout on the Main Street and you'll probably see the row of marquees before the signage for the market appears. As it's in the main shopping area, there's parking along the shop fronts (both ways from the roundabout) in easy walking distance of the market. As you approach on foot, you'll pass a wonderful green grocer with good quality fruit and vegetables at much cheaper prices than urban Melbourne. Don't be put off by the market's apparent small size – it covers much more ground than the first few stalls you can see outside. Overall, the market has a warm, welcoming feel with a range of vendors covering food/refreshments, clothing/textiles, health/beauty and gifts. 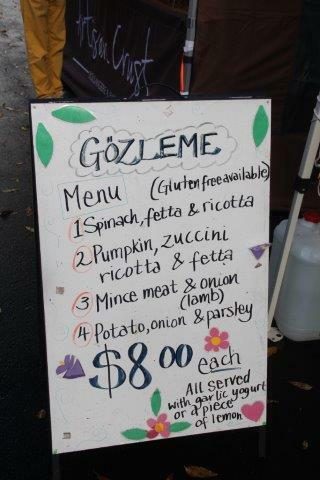 I see a caravan with beautiful artisan breads on show, a stall has a wide variety of nuts (roasted and natural) and snacks where you can also get a hot Turkish Gozleme made while you wait. Nearby, cooks attend another hot grill and prepare ready-to-go hamburgers or sausages - the aroma is hugely appetising for breakfast or brunch on a cold Sunday morning. 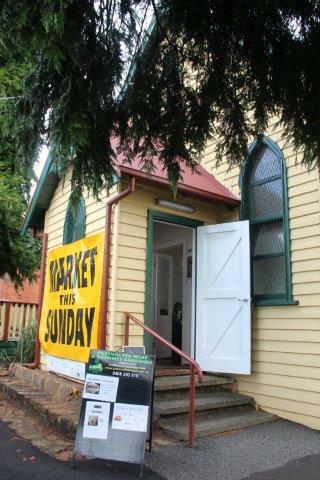 Part of the market is inside a renovated Church Hall and directly out front is "Flitterby". 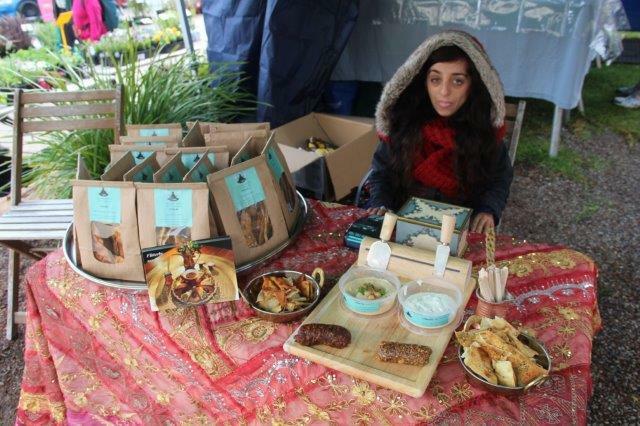 Although her stand is tiny, her offerings of Moroccan and Middle Eastern influenced morsels look scrumptious – today she has crisp Marmalade Chips (to go with her Hummus and Labneh), a Date & Walnut Log and other wonderful Meze. It's all available for tastings and sale. 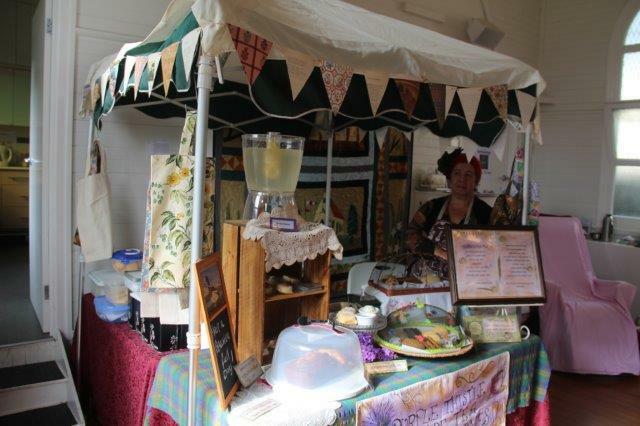 Inside the church hall, a selection of home-made Anzac biscuits, slices and cakes is on offer from a smiling vendor who can also provide a Devonshire Tea, a classic lemonade, or a coffee for refreshment. Devonshire Tea or a cake perhaps? At Marie's Cakes there's a strong vibe of home and hearty food. Marie's kitchen has health/cleanliness certification and she certainly has an impressive and delightful range of goods. She will take orders too. 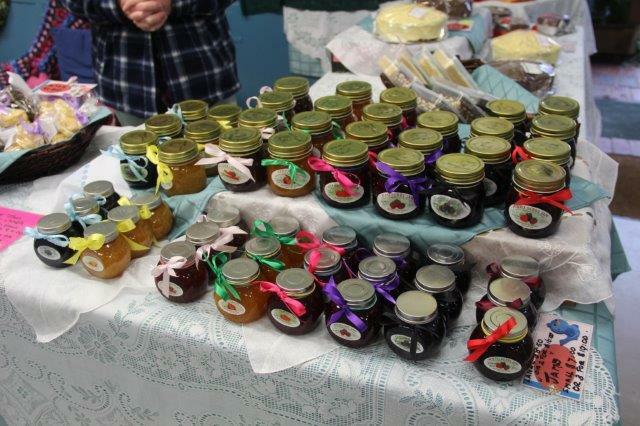 I particularly like the array of brightly packaged speciality jams and marmalades she offers - made without added sugar or chemicals, which means they will last for a long time if they are kept exactly as she instructs. Several stalls and friendly vendors offer colourful and cozy looking winter jackets, wraps, chunky scarves, gloves and jumpers. There are mohair and textile rugs and throws too. Inside, another stall-holder welcomes me to Cec's Crafts (and random geekery) with a wide range of items by Cecilia Cranfield (hand-knitted hats, scarves and goods) in a range of sizes. Inside, Jan Murray has several household and beauty items by Tri Nature that are all produced in Australia with natural ingredients and a "tried and true" reputation. She highlights key items by other smaller Australian producers too – all natural sunscreens and exfoliants without harmful chemicals. A therapy chair in the corner is where Kerry Anne Armstrong smiles broadly and offers Reflexology to manipulate feet and offer therapy to any problem areas in the body. TEVA Apothecary is an "organic herbal dispensary" with their chemical free and colourful food wraps - not only useful around the house, but ideal as gifts also. At TEVA, they focus on the benefits of plants and simple herbal remedies. Their product line, "Gypsy Herbals" includes organic tea, skincare and herbal honeys. They also aim to create a community of growers, herbalists and artists who will produce eco-friendly products and services. Across the good range of handmade items in paper, felt and timber, my eye is drawn to the offerings from Joyce Brown. 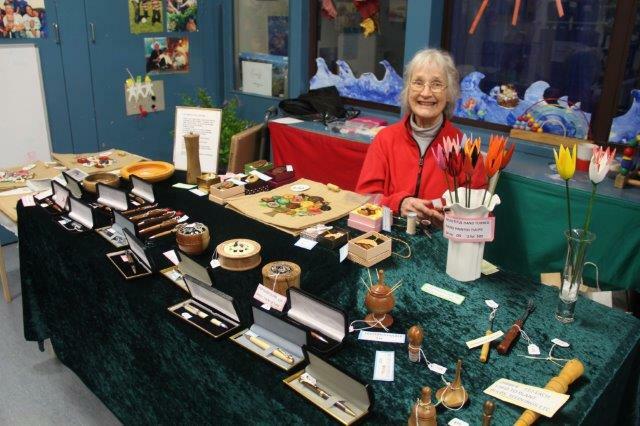 She is a local Woodturner who creates a range of beautiful work - suitable as gifts, all made from native timbers. Her stall is Just 4 Wood and her high quality stock is reasonably priced. Nearby, Belinda is at the helm of BC Charmed Jewellery, which displays truly charming necklaces and trinkets. 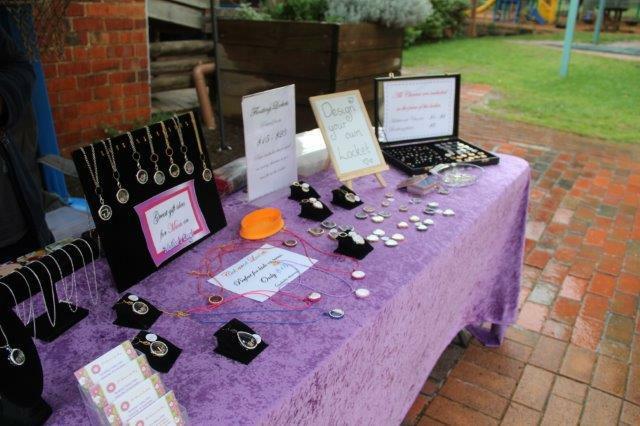 Her special product is the unique "floating locket" with an easy opening but a magnet to keep it secure and allows the wearer to insert whatever they wish - perhaps a photograph, special lock of hair or just a gift charm that Belinda has for sale at the stall. Floating lockets, trinkets and charms at "BC Charmed Jewellery"
George Steel's fretwork is fascinating - he personally designs and creates hand-cut wooden items (in just about any theme a customer would like). 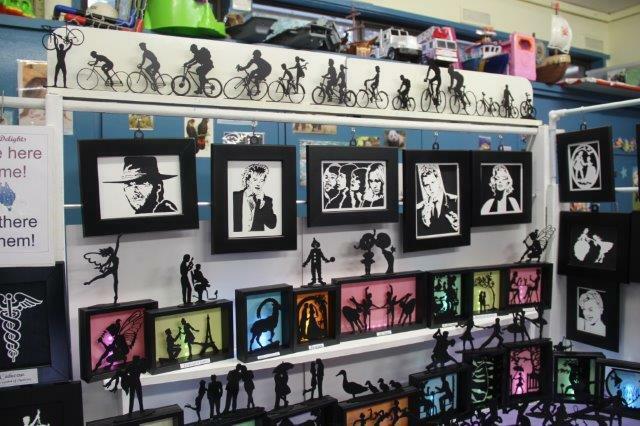 The pieces range in size from tiny statuettes to framed silhouettes of celebrities and there's everything in between. 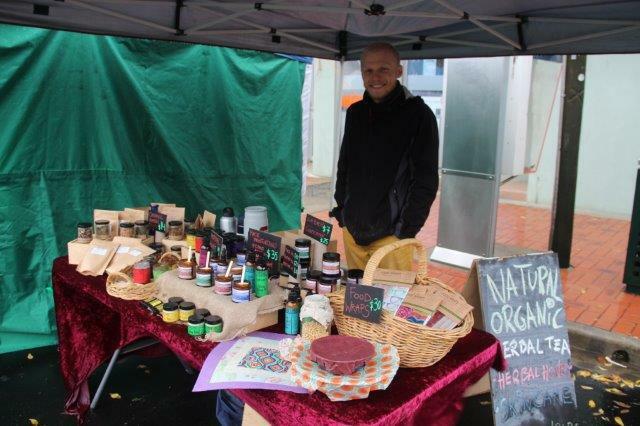 His stall is "Market Delights" where the products are good quality and very reasonably priced for gifts. I am totally enthralled by his work. George Steel's unique fretwork at "Market Delights"
This market certainly has something for everyone. All the stall holders are delightful and the products are very high quality. You are sure to find that unique gift here. When: 9am to 3pm on the third Sunday of each month, all year round.